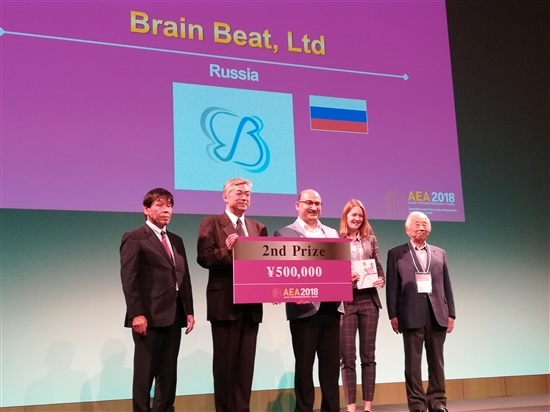 Brain Beat, a resident company of the Skolkovo Foundation’s biomed cluster that has developed a non-invasive glucometer, won second prize at the 7th Asian Entrepreneurship Award in Japan earlier this month. Edward Krizhanovsky, CEO of Brain Beat, holds up 2nd prize with the other winners in Japan. Photo: Brain Beat. Unlike a traditional finger-stick test that requires a drop of blood, Brain Beat’s glucometer enables diabetics to measure their blood sugar level simply by putting their finger inside a small plastic device. The jury noted that the project was less than one full point behind its competitors, and awarded Brain Beat 500,000 yen (about 300,000 rubles) and the use of three workspaces at a Tokyo coworking space for the next two years. Edward Krizhanovsky, CEO of Brain Beat, said he saw a great deal of interest from potential investors and major Japanese manufacturers of medical devices during the competition, which he expects to develop into concrete results. Brain Beat is now in talks with a major medical technology manufacturing company whose products include traditional glucometers, he said, declining to name the company until negotiations are complete. “They are the leaders in Japan in this sphere so I think there’s every chance that we will have success together,” said Krizhanovsky, adding that Brain Beat also plans to launch cooperation with a major telecoms company in the near future. Brain Beat's glucometer is non-invasive and simply requires people to put their finger into a small plastic device, as pictured above. Photo: Brain Beat. 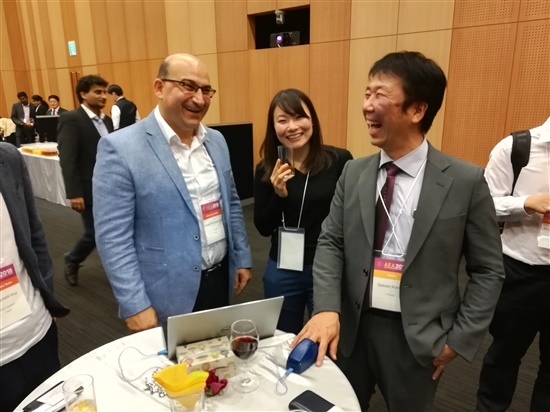 Twenty startups from the Asia Pacific region took part in this year’s competition, which focused specifically on artificial intelligence and medical devices and took place in the Kashiwa-no-ha smart city. Brain Beat, the only Russian company taking part, was a fraction of a point behind the winner – a team from New Zealand who had designed a shopping trolley for automated, checkout-free food stores, the organisers said. Many attempts have been made in the last 20 years to produce a reliable non-invasive glucometer, to eliminate the need for diabetic people to perform a finger puncture test up to eight times a day. Like previous attempts, Brain Beat measures the optical absorption spectrum of glucose in different ranges. But unlike those attempts, which have failed to produce reliably accurate results due to factors such as moisture on the skin and different skin types, the Skolkovo resident company says its technology is as reliable as traditional glucometers, thanks to the use of special light-emitting diodes and photodetectors developed by the team, as well as nonlinear methods of calculation. Krizhanovsky, for whom Japan has a special place in his heart, is optimistic that Brain Beat can successfully enter the Japanese market. He said the company could spend the prize money on returning to the country to continue negotiations while working out of the coworking spaces that Brain Beat was awarded. “Japan is a really interesting country for us,” he told Sk.ru. Krizhanovsky and Skolkovo's Julia Tolkishevskaya pose with the award. Photo: Brain Beat. The company is currently working on a bracelet version of the glucometer, and plans to obtain certification and carry out clinical studies in Japan, the U.S., China and Europe next year. Earlier this year, Brain Beat won first place in the AstraZeneca-Skolkovo Startup Challenge, winning it a place on the first joint accelerator programme organised by the multinational pharma giant and the Skolkovo Foundation. 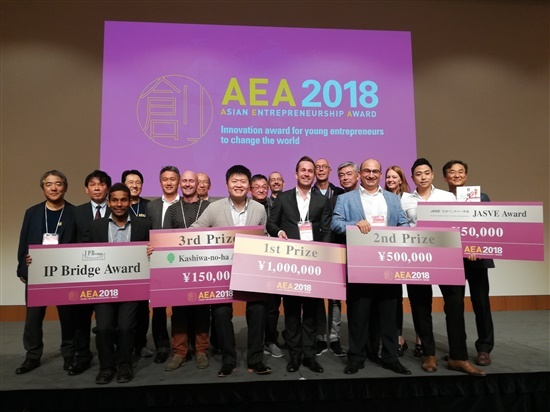 The Japanese market has only relatively recently become more open to startups, said Krizhanovsky, citing the Japanese organisers of the Asian Entrepreneurship Award. “The Japanese themselves say that their investment market only appeared quite recently, seven or eight years ago. Before that, large enterprises looked down a bit on startups and new projects, so the dialogue was somewhat different. Now that economic growth has slowed, they are looking at the experience of other countries like the U.S., and realise they have to interact with startups on the level of partners. So they are trying to develop Japan’s innovative environment as much as possible, and it’s quite young,” he said. Julia Tolkishevskaya, a senior project manager within Skolkovo’s international cooperation department who was present at the Asian Entrepreneurship Award, said it was the third time Skolkovo had sent a resident company to the competition, and the third time it had placed in the top three (in 2016, express stroke test maker DRD won second prize, and last year, WGT took third place for its development platform for developing web apps with interactive 3D graphics). “It goes without saying that each of the Skolkovo companies to have taken part in this competition has its own strengths, but they all had one thing in common that was noted by our foreign colleagues: that their innovative products are based on fundamental research,” Tolkishevskaya told Sk.ru.